POSTCARD #104: Delhi: 05.00 hrs: The sound of the generator – a power cut, no lights. Holding my phone so it shines like an electric torch I come out from the bedroom and through to the front of the house. Startled by the flashing light reflection in the large glass patio window; light beams swinging over the walls, forwards and back with the movement of walking. My own reflection catches me unawares at this early hour of the day confused by large sound of generator. It triggers a memory from long ago; some time before dawn, me and grandfather on the tractor going over the hill to see the sheep. When I tell people my grandfather was a shepherd, there’s a moment of… let’s see, no words for it really – kinda Biblical, mediaeval? It helps to think of him like a veterinarian. We’d get down from the tractor and set off on the track across the hill. Grandfather with his huge steps and I must have been only nine or ten years old, holding the big old torch with both hands, aiming the beam along the path to ancient things, ancestors I never knew. Grandfather had a shepherd’s crook; a long pole he used like a walking stick, but with an iron hook on the end to catch the sheep. On this night we mingled amongst the flock until he saw the one he was looking for, quickly caught its leg with the hook and it fell over on its side. I was then told to quickly hold its head. He was a big man, wore two totally ragged old jackets, one on top of the other. No polyester in those days, no machine-washable hooded shell coats with velcro fastenings and good-looking yellow nylon zipper. No, my grandfather looked like a homeless person. He’d roll up the sleeve of his right arm, hands like the hoof and horn of the sheep itself; not beautiful hands, birthing hands. Push his fingers into the back end of the sheep, then his whole hand up past the wrist and part the way up the forearm. Quite a long time spent feeling with fingers in the darkness before birth, find the lamb’s feet and nose, and pull the whole thing out with a steaming slither and plop on the grass. I’d be at the other end, holding down the beast’s curled horns, struggling head, a fog of breath in the air, spittle froth, tongue, nostrils, and these wild, wide staring eyes. Then from behind me, there’d be this small bleat: mae…. On Grandfather’s signal I let go of the head, jump back and the sheep is up, turns around and long nose nuzzling the small bundle shivering on the grass. Mae…says the lamb. Baah…says the sheep, licking away the afterbirth around the face of the lamb… mae-ae-ae… baah-baah… mae-ae-ae… baah… mae-ae-ae… (sheep language). The whole thing quite astonishing. An event there on the side of a hill, illuminated in the beam of a torchlight in the long shadows of remembered past. Fifty years later and I’m here in Delhi, about the same age as grandfather was then. 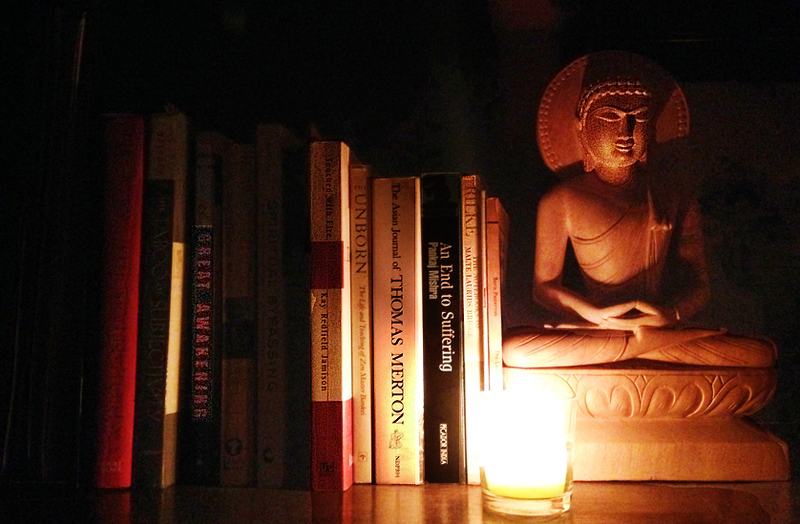 Light the candle by the Buddha on the bookshelf – familiarity of candlewax, oil lamps and no electricity; it’s another day no different from that day then or any other day. Outside, a faint smell of dung; cows and sheep sleeping in some corner of the street, at rest in these urban surroundings as if they were in a landscape of fields and meadows. What a beautiful memory! I was having a conversation with a few people just the other day and we were wondering why we don’t see shepherds any more. It seems the sheep are all out on their own here in England. There is a timelesness to the silent dark and the moment of birth… whether babe, lamb or dawn… or even the birth of a flame in the night. Oddly enough that is a concept we have been working with for a while. Many of the older systems of thought seem to have recognised that perspective. The darkness was the growing time.. the womb of life. It still is… but as you say, we have forgotten in our artificial, brittle brightness. I love that quote.. I hadn’t come across it before… thank you. I’ve felt that way a while. Oh how beautiful!! The darkness, the wonderful memory! It is blessed. I was lucky enough to be invited to see new born lambs and it was an ecstatic experience to see the lambs and their mothers. I took many photos so missed touching them but unforgettable was the abundance of joy! How fortunate you were to have a father who was a shepherd!!! As for the light and the darkness, we have so polluted to world with artificial light that it is impossible to see the awe inspiring stars at night in most places that are urban. Luckily we get to escape to a little barn on the edge of the woods where there is virtually no light. What a lovely memory for you and thank you for sharing it! I remember them being really so small, perfect miniature creatures, the word ‘cute’ doesn’t describe it. Miraculous is better, it’s really so much more than words. And seen from the angle of there being first the darkness then from that comes the birthing, the coming into light, and the analogy for understanding, knowing. Thanks Ellen for your lovely comment. So many precious things come out of darkness….. Love the quote T.
This is such a beautiful memory filled post….your writing had me walking beside you on the rough hillside path in the darkness. Something very eternal about memories and experiences like this, close to nature, close to the birth of new life, close to our ancestors. Memories shared by generation after generation on the same spot on earth. We still have shepherds here in scotland, but they tend to travel on quad bikes…even at the age of eighty!! So easy to love sheep, and those who love them. Am I sniffing a metaphor somewhere here? I am struck by the path this blog took to get through your consciousness and into the world– a power outage, a torch in the darkness, a flooding memory… Memory is really unbelievable– it’s volatility, it’s proximity, it’s haunting intimacy. It’s like an ocean of fish glowing in the dark, as big as any ocean we know of, and somehow, no matter what experience brushes along its surface, at whatever point in the vastness, precisely the right fish is waiting right there to leap for it. Like a trout splashing to the surface to eat that insect. So generous… it takes my breath away. Grandfather was a man of the earth, didn’t think about how it could have been, only thought about what we need to do now. Hard to believe – that kind of simplicity and sureness… I hope I inherited some of that. Thank you Michael, grandfather would have rejoiced in your words, that scope, that great space of ‘an ocean of fish glowing in the dark, as big as any ocean we know of’ – he’d have laughed and thought and wondered… I laugh on his behalf. Old spirits stir, recognise this, acknowledge… it’s how it is. Tiramit, love your writing. You take the mundane and turn it into something beautiful. You put your readers into the experience you are describing with your unique style of expression. I was there with you, grandpa and the sheep, the smell, the hills, grass, the sounds of the sheep, the ruggedness of grandpa, the young boy learning about life, the all of it. Your writing brings out the wonder of experience that we so often remain oblivious of. Thank you for that and please keep sharing your life with us. Thanks, yes, well, maybe it was my own awe of grandpa, and the topic of the post is extraordinary of course. Usually, I try to trim the content as much as possible: “a sentence should contain no unnecessary words…” and this kind of minimalism in choices seems to fit with the general theme of expressing momentary conscious experience – language only barely manages to encompass these moments… a kind of ongoing summary of events. it strikes me how altered I feel by reading your words which have taken me on a journey away from this life and placed me into your own memory, complete with the light and place and happenings so that I feel to have walked this experience myself. subtle and humble transcendence 🙂 thank you! Beautifully written Tiramit, it was as though I was right there, seeing and feeling that wonderful, natural event with you. It was magical and held me quite mesmerized as I read it. Thank you, and Merry Christmas!